This is a quick collection of terms used within the world of Mage Academy that isn't used within real life all that much. Though some terms would appear in popular video games or television series, or they may have different meaning here compared to real life, it is still important to have a basic collection of information in case of need or quick search. Everything is complied in alphabetical order, and members can feel free to contribute as long as it's something generally acceptable and logical, as well as used by other games reoccurring, or if it's an idea the community of Mage Academy accepts. Private Message me with the term and a definition and I will add them(Type them anyhow, as long as they're understandable I'll try my best to word them as best as I can). NOTE: This is a work in progress and can be completed through time and contribution. Alchemy - Alchemy in the world of fantasy refer to using materials or ingredients to create potions with various effects, done through a process referred to as brewing. Each effect of each potion differs depending on the ingredients used, the quality of them and the skills of the brewer during the process. Archmage - Archmage (also called Archmagus, plural. Archmagi or Archmages) is a high ranking status bestowed upon an individual who has proven themselves to be a true master of magical arts. They are regarded as the highest level of spell casters and even hold their own against a Headmaster-ranked mage. The title is usually bestowed by high ranking members of the Magical Council to individuals who have mastered their magical arts. Channeling - The act of channeling refers to a spell that requires the user to continuously release magical energy for a period of time for the spell to function properly. There are many variations of channeled spells, such as ones that are constantly giving effects until the user runs out of energy or the spell is canceled by will or not. It can also refer to spells that require a large conversion of energy dedicated to a specific spell that requires that amount to cast, and requires a great deal of time to be cast. Cursed - This can refer to many things, being a cursed item, a person or object afflicted with a bad omen, or even a hex placed on someone. Item - This is whereby an item has been bestowed power of a tremendous force, but however it has a very negative effect, usually equal or greater than the positive effects of the item. Cursed item are extremely powerful when wielded, but it can also be very lethal or frustrating to use. Cursed One - A person who is cursed will receive very bad occurrences, or bad luck in simple terms, due to the spell, hex or supernatural force evoked upon them. There are many ways where a curse may be broken just as it is cast but in a reverse way, but some are people born with unbreakable and lifetime ones. Spell - A cursed spell is one which is highly effective in many ways, but also has drawbacks which may harm the user and put them at a disadvantage. Cursed spells are very powerful ones, but come at a very dangerous cost associated with the commonly the caster, yet some spells can affect another person other than the caster, such as the target or a third person. Enchantment - This is where an object or rarely a person has been temporarily empowered with special or magical abilities through the use of an incantation from a nearby spellbook, or blessed by a powerful entity, or infused with magical energy by a magic user for a desire effect. Feral - Feral is a term commonly used to describe a wild/savage creatures, inclusive of humans who have lost sense and reasoning, and have inadvertently turned hostile to other beings. They are brutal and relentless, yet may still hold a concern of self-preservation. Fiend - Fiend refers to a common form of unholy beings, usually associated low-level demonic spawns such as Imps, however they different from the civilized versions due to their mischievous and troublesome personality as well as their wicked nature. Fiend (2) - Fiends are walking mountains of muscle capped with horned, tooth-filled heads. Like their rarer cousins, bumbakvetches, they live in thick forests, swamps and bogs. When possible they avoid humans, but when not possible, they kill them, and without much difficulty. Headmaster - A self-explanatory term, the headmaster of the overseer of a School and Academy. 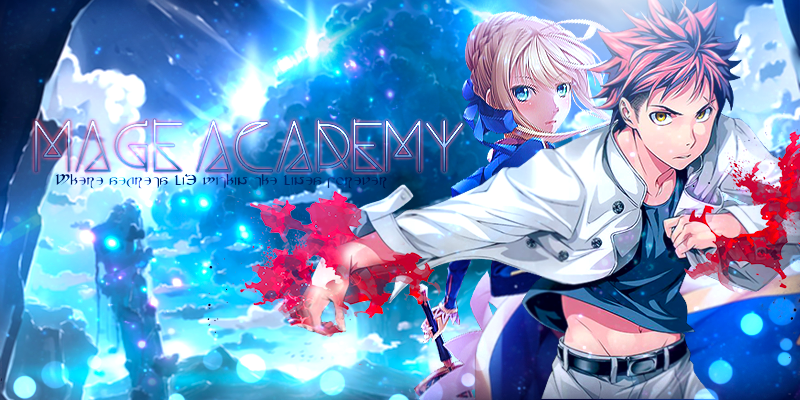 At Mage Academy, the Headmaster is the high ranking individual who has taken up the responsibility with their right and power of overseeing the Academy and making sure everything remains in check. The Headmaster is said to be among the most powerful of magic users around and alive, common being classified as "S" rank personnel. Grant Vampires - Only a mutual thirst for blood links vampires to their distant and much more primitive cousins whom bare close resemblance to humanoid bats. Higher vampires are, in fact, much more similar to humans than simple blood-suckers. They not only resemble us in appearance, but also share our intelligence and behavioral patterns. It is a mage's good fortune that higher vampires are extremely rare, and not all are dangerous to humans. Though they do have a taste for blood, they do not need to drink it to survive. Some higher vampires have renounced feeding on humans altogether and do no harm to anyone, but others give in to their desires. Spell Immunity - This is whereby the object this applies to is unable to be affected by magical forces and will take no effects spells. The only way to deal with objects carrying this effect is to use physical means or through the use of pure energy. Mage - A Mage (plural Magi or Mages) refers to beings that have learned to be utilize magical energy order to carry out unnatural actions such as casting spells or empowering items, yet the level of Magi varies very differently as Magi rely purely on gained knowledge and experience in contrast to a Sorcerer. The term however is used generally to refer to people who use magic. Magical Energy - Commonly referred to as Mana, is the mystical energy found within living beings such as humans, felines and canines, or imbued into inanimate objects such as metals or stone. Mana is constantly created most commonly by living beings that possess a soul/lifeforce, yet there have been objects capable of emitting/radiating amounts of magical energy. It is also constantly present in the air as well as within the planet itself. Mana is used for casting spells, conducting channeling and powering certain types of machinery. When a living being is stripped of its magical energy complete, all biological functions shut down, in other terms, they die. Normal - Not to be underestimated or mistaken for simple people with no remarkable abilities, a 'Normal' can have quite varying abnormal and superhuman attributes and powers. To a Mage, a normal is someone or something who does not possess the power of magic or the knowledge to utilize magical energy. A normal can still have psychic-related abilities, a natural amazing trait or even the strength of a titanic creature. There have even been known normal classified beings that are adept at hunting and killing magic users. Relic - A relic is a object that has been blessed by a significantly powerful entity and gifted extremely strong powers. These are usually items devoted to representing a trait of a powerful god, goddess or mortal leader who possesses an extraordinary power or such. Relicts - Relicts are not to be confused with a Relic, the term Relict does not cover just a single term for a creature but rather a sub class for a wide range of creatures who have outlived most, in other words ancient and powerful creatures. Spell - A spell is a form of magic whereby an incantation, motion, sigil, rune or thought is used in order to utilize mana and carry out the effect of the spell. They are used by magic casters for multiple purposes such as combat, medical and auxiliary. Weapon Oils - Weapon oils are special liquid concoctions applied to various forms of weaponry to provide special attributes and act as physical means of enchantment however temporary. They take several minutes to apply and only last approximately a few hours, hence application of weapon oils can only be done out of combat to avoid risk. Zweiteturm - This is the massive and enchanted Library located within the Spell District of Mage Academy. It contains multiple scrolls, tombs, books, grimores, and so on. There is a special restriction spell with in to prevent students from casting a high level spell that is beyond their capable magic level, mostly to avoid the destruction of the Zweiteturm due to the Librarian's standards, as well as to prevent student causalities from overpowering grimores and tomes. Bombs Bombs are area-effecting, thrown projectiles which can damage, stun or cause other effects on clustered groups of enemies. In order to create bombs you need alchemical ingredients to maximizing effects. Celandine A common plant with medical properties. When it blooms its white blossoms become an iconic figure known by most. Herbalists around the world use this plant to cure illnesses and speed up regeneration of wounds, it also helps to stop bleeding. Its easy enough to distinguish between White myrtle as well as they are both white, Celandine has shorter stalks making it much different in appearance. This plant is well suited in the use of Alchemy, such as concoctions. Plague Maiden When plague ravages a region, a spirit will sometimes walk its lands, a ghost resembling an ill woman whose flesh rots off her bones and in whose wake crawls a cavalcade of rats. No one knows whether this spirit brings the pox with her or is merely drawn to it like a moth to a light. Yet it is certain that she delights in dealing pain and suffering, in hearing the howling and moaning of men. Swallow - Symbolizing spring and rejuvenation, the swallow lent its name to this potion that accelerates the rate at which wounds scab over and heal. As a universal brew, it is good on many occasions and additionally produces no side effects.